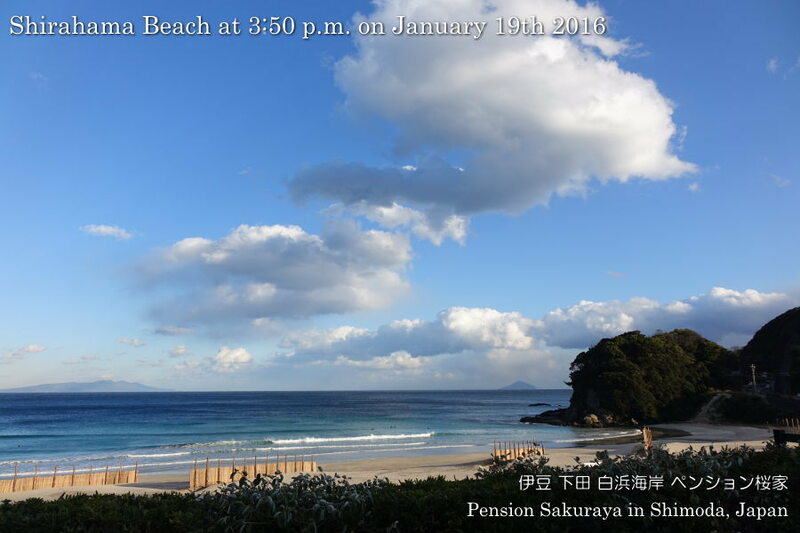 This morning we had a lot of clouds in the sky, but the sun came back before noon. So I was able to take a picture of Sakura blossoms under the blue sky. 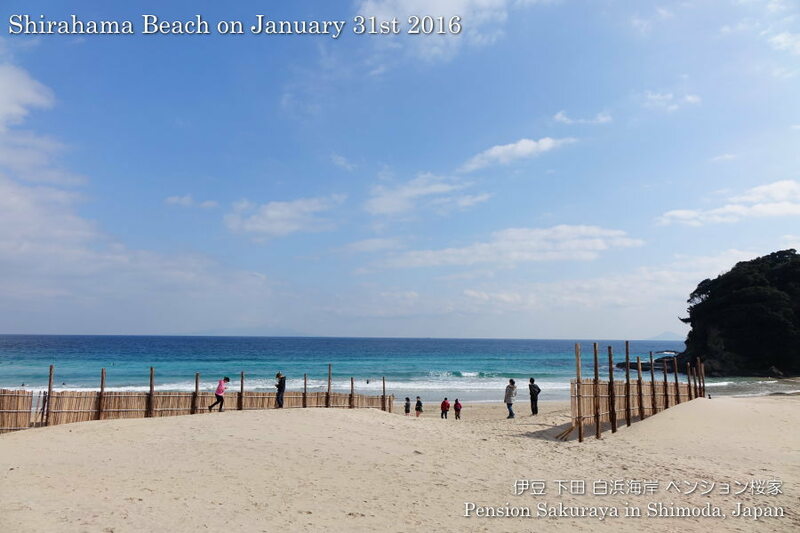 This entry was posted in beach, Flower on 2016年1月31日 by izusakuraya. 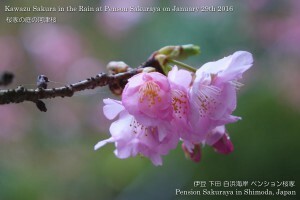 Of course Sakura blossoms under the sun is beautiful, but I love the blossoms in the rain too. 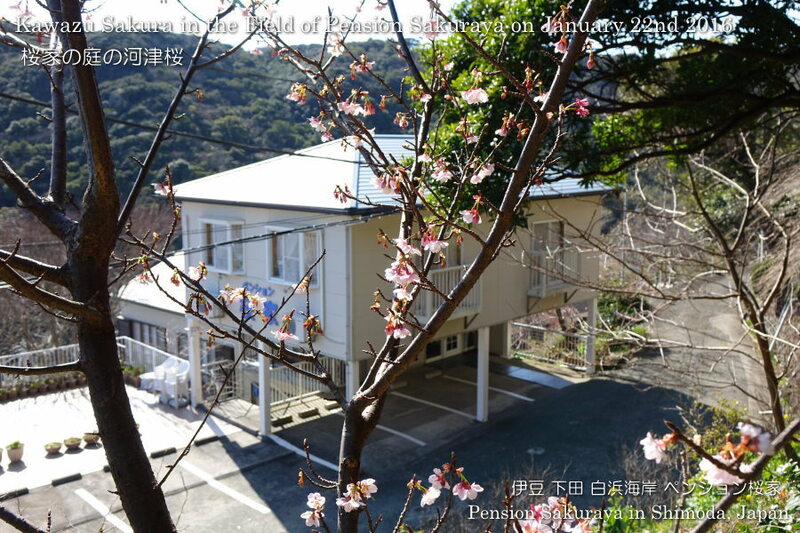 This entry was posted in Flower, Pension Sakuraya on 2016年1月29日 by izusakuraya. 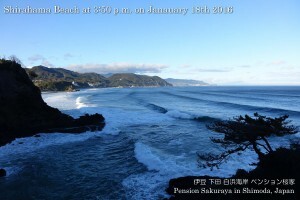 Today we didn’t have strong and cold wind and it was warmer than yesterday. 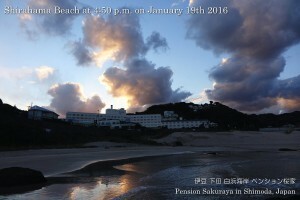 This entry was posted in beach on 2016年1月27日 by izusakuraya. 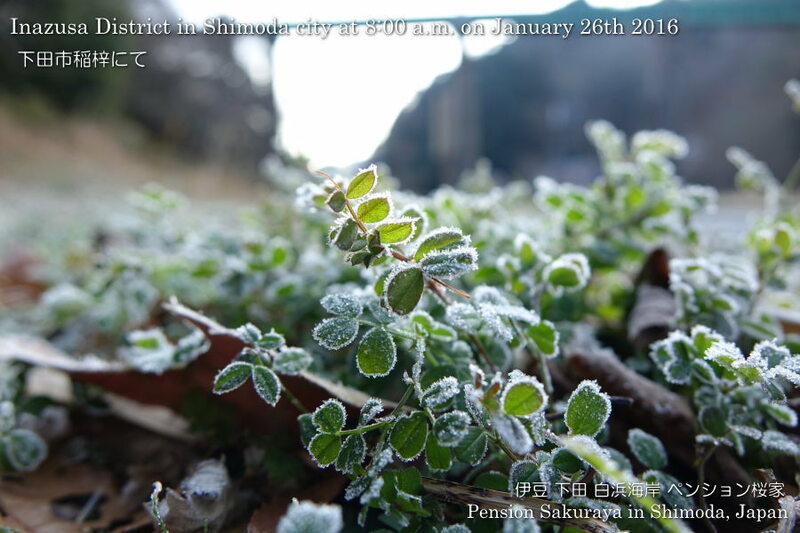 After I took my daughter to school by my car I went to the mountain side in Shimoda this morning, and noticed that it was -4 degrees centigrade. 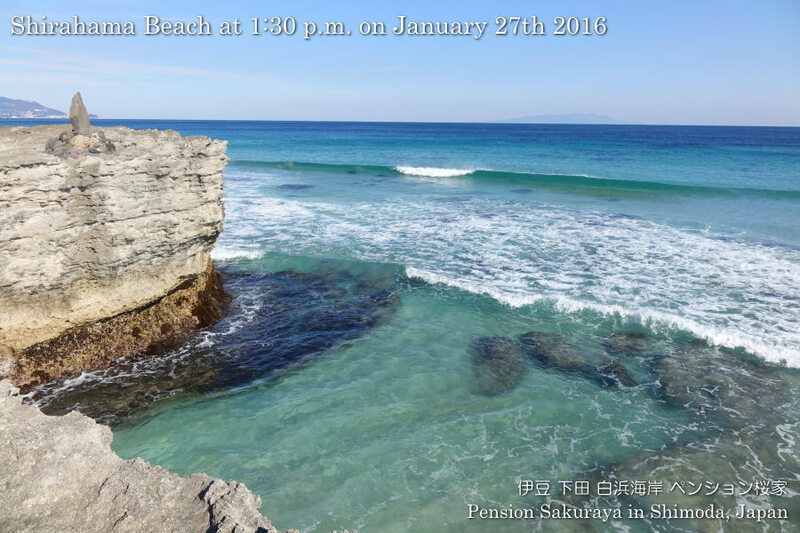 The temperature difference between Shirahama and this place is over 7 degrees, the distance is only 5 or 6 kilometers though. This entry was posted in beach, nature on 2016年1月26日 by izusakuraya. 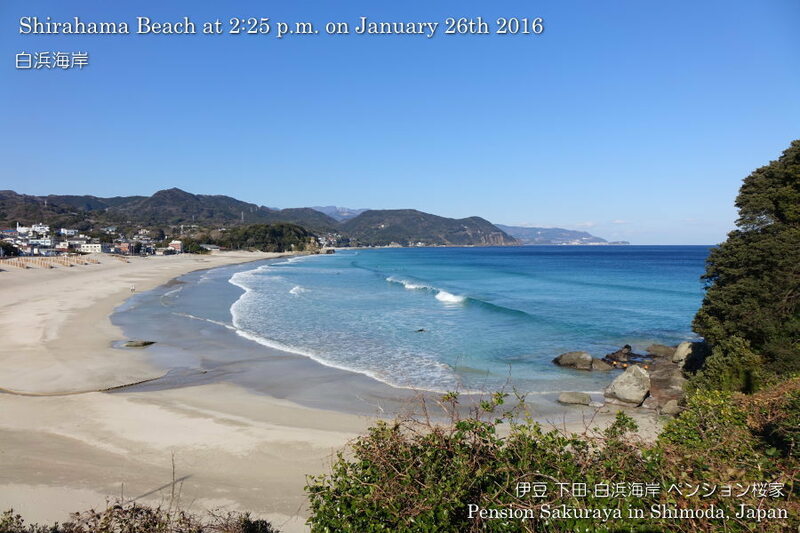 We had north wind a little, but it was very warm today. 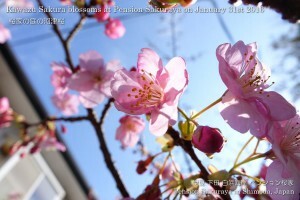 In these days sakura trees stopped blooming because it had been very cold, but they restarted blooming again. 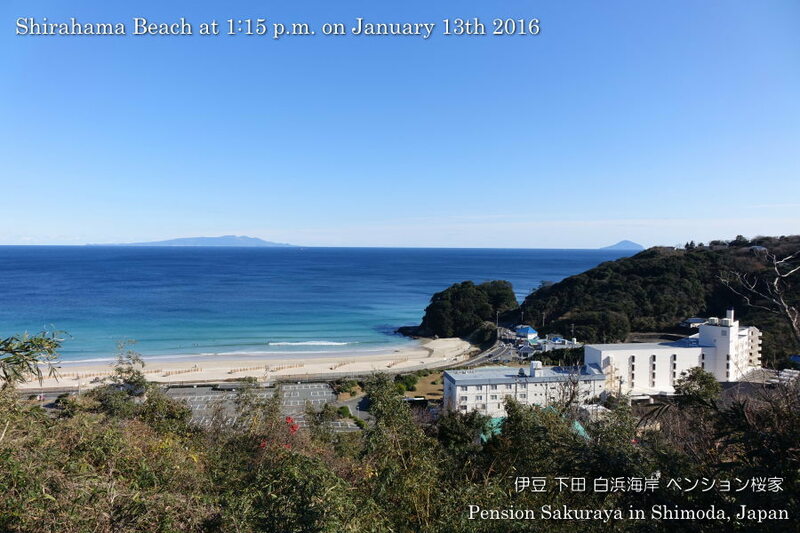 This entry was posted in beach, Flower, Pension Sakuraya on 2016年1月22日 by izusakuraya. During winter we can see the blue and clear water because the water temperature is low, about 15 degrees centigrade. 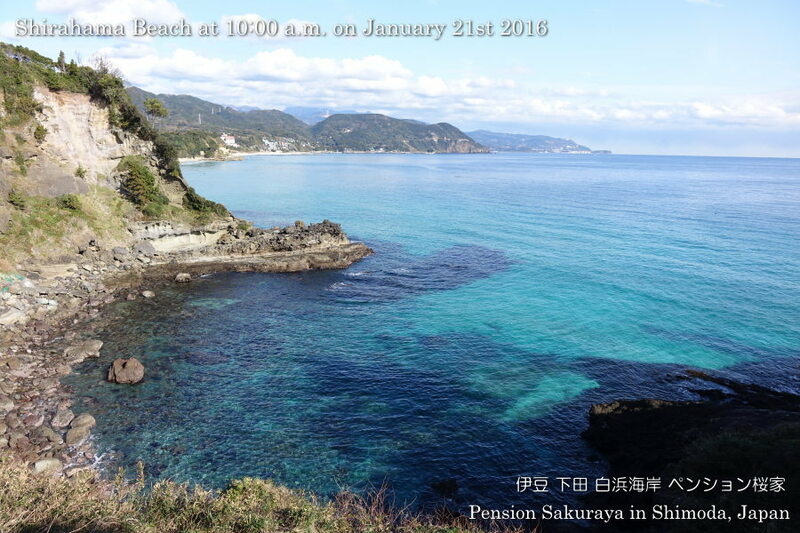 That’s why I want to snorkel in the water, but there is no tropical fishes in this season. 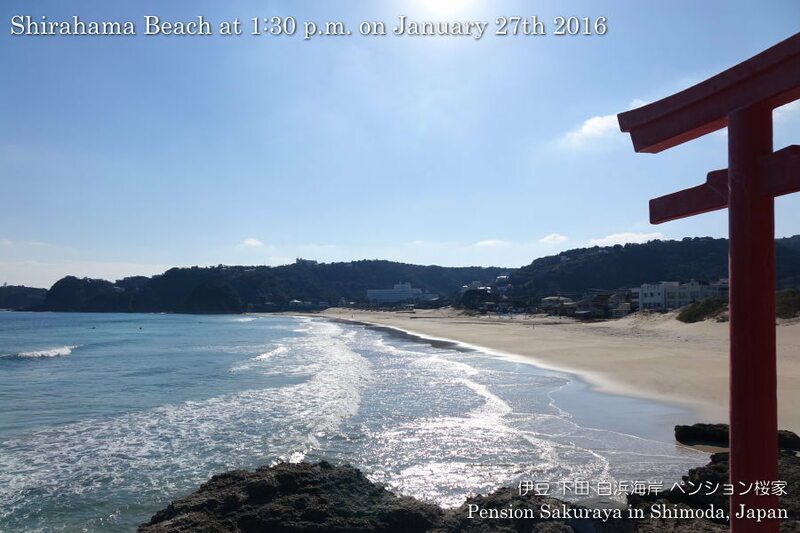 This entry was posted in beach, nature, Sea on 2016年1月21日 by izusakuraya. It was beautiful day, but we still had strong west wind today. 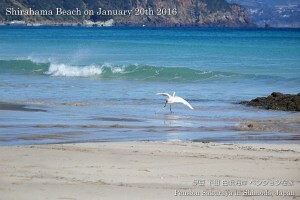 When I went to the nearest beach a white egret was having lunch and was eating small fishes in the water. 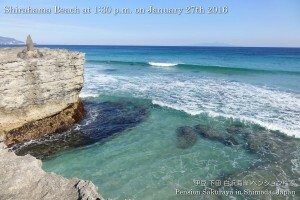 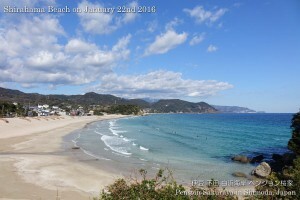 This entry was posted in beach on 2016年1月20日 by izusakuraya. 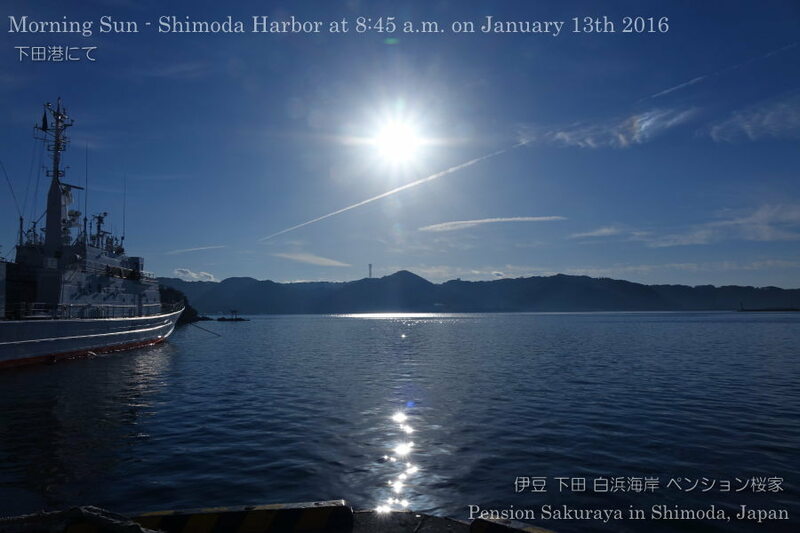 This morning the sun was shining on the eastern side. It was sunny today, but we had very strong and cold west wind. 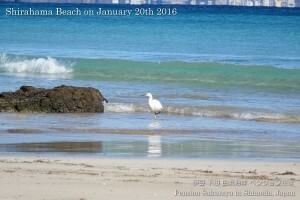 This entry was posted in beach, nature on 2016年1月19日 by izusakuraya. 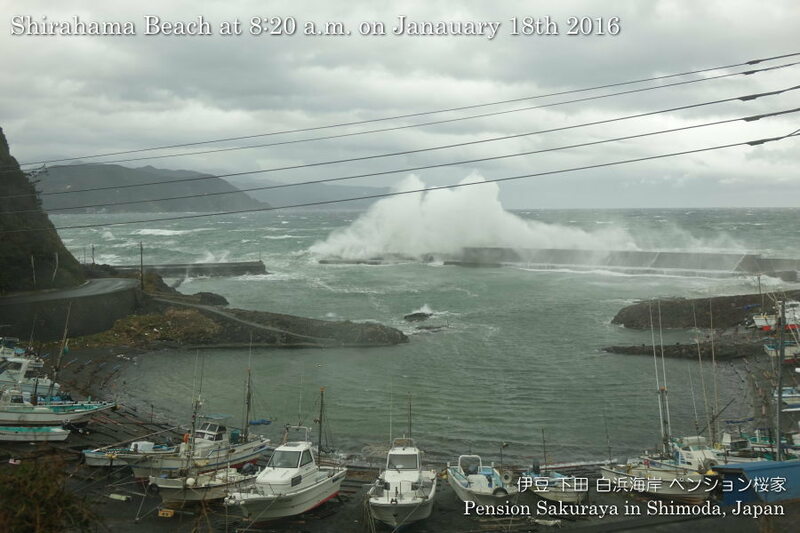 We had a big storm with rain and strong wind like typhoon last night. 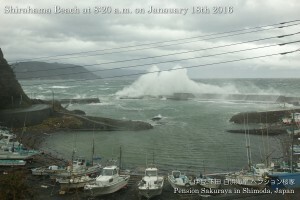 This morning I wanted to take pictures of rough sea on the seaside road after I took my daughter to the school, but the strong wind from the rough sea prevented me from getting out of my car. 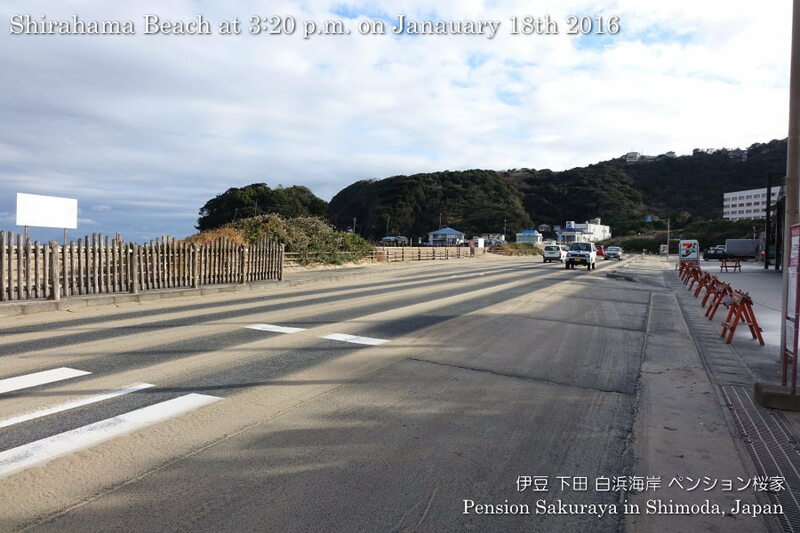 I walked on the seaside road this afternoon. 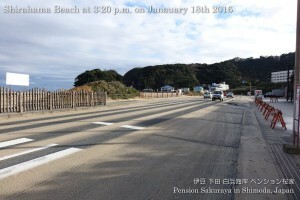 The seaside road was covered with a lot of sand blown away by the strong wind, but it was very good condition for surfers under the sun light after the storm. This entry was posted in beach, nature, Sea on 2016年1月18日 by izusakuraya. After I took my daughter to the school by car I took a picture at Shimoda harbor this morning. It was cloudy in Shimoda yesterday, but the blue sky came back again. 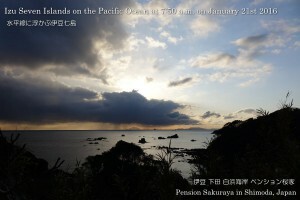 I was able to see the Izu seven islands clearly today. 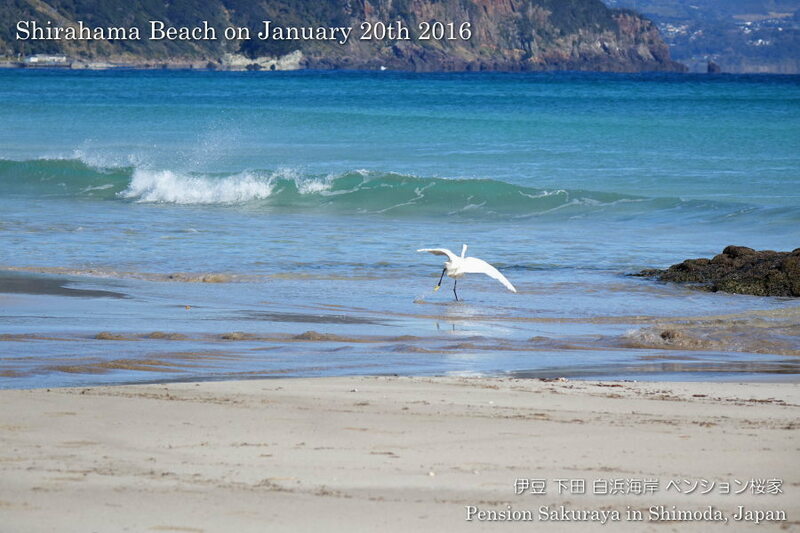 This entry was posted in beach, nature, Sea on 2016年1月13日 by izusakuraya.